Canadian winters are notoriously harsh and that impacts our vehicles. By teaching Canadians about post-winter inspection and maintenance needs, we can help to keep them safer on the road and avoid breakdowns throughout the spring and summer months. 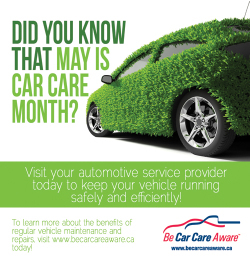 In May, Be Car Care Aware promotes car care by writing articles on spring maintenance needs, sharing car care tips on Twitter and Facebook, partnering with like-minded organizations to encourage Canadians to have their vehicles inspected, and helping industry members like you to share the car care message with your customers. Promote Car Care Month on your website, via social media, and in your shop. Host a car check event to raise awareness about maintenance and repairs in your community. Add a quote to one of the articles in our article library and submit it to your local newspaper editor for publishing. Just don’t forget to mention us! Run an ad in your community newspaper, on your local radio station, or on TV to promote your company and Car Care Month. Promote the campaign by handing out Be Car Care Aware resources to your customers with their invoices. Run a special in May for Car Care Month to get people into your shop. There are lots of ways that you can use Car Care Month to help drivers in your community understand why maintenance is important and why their cars need a little extra TLC after the cold. And presenting yourself as a source of information as well as service will help to promote your company image and build trust with current and potential customers.